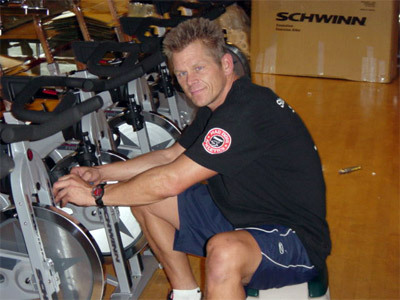 I woke up on August 19 to read that indoor cycling enthusiast and specialized mechanic Jeff Wimmer was dead. Some of us have been in the business a long time and should expect that people around us will die; it’s part of growing old. Still, when someone as notable as Jeff Wimmer leaves us early, the enormous gap can’t be filled. Jeff was what the cycling world calls a “wrench”. He fixed bikes, specifically indoor cycles. He taught for a while but, like a few other talented instructors, gravitated toward cycle construction, design and repair. Jeff performed work for ICG and for me on several occasions, and I encouraged his employment in years-long contracts when I worked for Club One and Frog’s Fitness. Anyone who has taught indoor cycling classes long-term knows that the industry had much to learn in the early years about maintenance of a group fitness product. Until we rode indoor cycles, no group exercise equipment beyond the stereo and the microphone ever had to be maintained. Suddenly, we had bikes that needed servicing and quickly deteriorated if your club didn’t employ a wrench. Jeff made a lot of us happy with well-tuned bikes that felt great – not to mention the many member complaints from which he spared us. If Jeff worked on the bikes, we knew every day we taught that the ride would be as smooth as new blacktop. Jeff did far more than repair bikes; he refurbished them. I guess that’s called “green” these days. He created a business, Studio Cycles, for restoring and reselling indoor cycles, which enabled many customers to purchase top brands at a discount. Unlike top manufacturers, though, Jeff did all his own installations. He never shipped a bike and let someone else put it together. Those of us on the product side of the business know the importance of a quality installation. No matter how good the manufacturing is, if someone who doesn’t care about the bikes puts them together, there’s a good chance they’ll break down prematurely. I feel the greatest contribution Jeff made to indoor cycling was what he did online. In all our industry, there’s no more prolific a blogger than Jeff was. The Internet features dozens of videos of Jeff discussing bike design and maintenance. He had a reputation for being merciless – but fair – in his evaluation of indoor cycles, and his positive endorsement could always be counted on to help promote bike sales. The last contract I hired Jeff for involved an evaluation of a customer’s bikes that were in disrepair. True to his nature, Jeff was so upset with the obvious lack of maintenance that he sounded off to the customer onsite, creating a difficult situation for my colleagues, the customer and me. The thing is Jeff was right. The customer did need to be set straight about taking care of the equipment. Jeff was passionate about bikes. Riding the road can be dangerous, particularly if the equipment isn’t properly tuned. Obviously, danger is considerably reduced with indoor cycles. But the good feel of an indoor cycle is the main factor that enables us to share our passion for riding bikes with our students. Jeff embodied the point I made in last week’s post. He was an artist. The maintenance and refurbishment of indoor cycles was more than his craft. You could tell from the way he spoke about Studio Cycles and his work. He approached every bike he fixed as a work of art. View his videos on YouTube; you’ll find them educational. Even more, they’re the legacy he created. On a personal level, I didn’t know Jeff Wimmer well, but I will miss him. I’ll miss having him pop up at tradeshows to give me his opinion about… well, everything. I’ll miss hearing him tell me that we should have him review every one of our new bike designs before we ever bring a bike to market. All of us at ICG® honor and respect what Jeff did for indoor cycling and will miss his passion, his blogs, his videos – and, mostly, his drive to help us create the perfect ride for our students. Rest in peace, Jeff Wimmer. You were as authentic as it gets. John's Note: sadly, this will be Jim's last post here at ICI/PRO. I heard from Joan Kent that Jim died Sunday of a heart attack. I'm not sure how to respond other than give everyone the chance to hear Jim Karanas one last time. What follows is my very first interview with Jim. Team ICG, ICI/PRO, the indoor cycling community and fitness industry lost a great man in late August 2013 in the passing of Jim Karanas. A born-teacher, Jim reached people all over the globe with his passion for instruction and mentorship in the indoor cycling community. His passion and wisdom live on here with Jim's many educational posts and Podcasts.